Like Kanthar Sashti Kavasam, Sri Saanthaanantha Swaamigal's "Skanda Guru Kavasam," is another famous Tamil hymn in praise of Lord Murugan - in the form of our Guru. Sri Saanthaanantha Swaamigal is a great saint and devotee of Lord Skanda who has established a temple – Skandasrama in Salem, India. Guru is a spiritual teacher who helps remove the darkness of ignorance in one's life and leads him towards the the light of wisdom, which frees one from the suffereings of earthly life. In Saiva Siddhanta, the importance of the Guru is paramount, for one cannot seek God-realization without the grace and guidance of a Guru - just as one cannot reach a destination in a foreign country without the help of a tour guide. The destination in this case is God, the foreign country is our earthly life filled with its karmic bonds, and the tour guide is the Guru - who knows all the pitfalls, deadends, detours, etc. encountered by the devotee as he strives to reach his goal (God). In Hinduism, it is commonly accepted and understood that the worship of Guru is worship of God - for the Guru is One with God. The Guru is the external manifestation of the real Guru (God) - who resides within all souls. The great Chinese poet Confuscious once said, "When the student is ready, the teacher appears." Similary, only when the devotee is ready, will the Guru appear. It is really God who senses the spiritual maturation of the devotee's soul and sends forth a Guru (saint) to help the truth-seeker attain self-realization - and thus, freeing himself from worldly existence (moksham). The fundamental foundation for this to occur is bakthi (devotion) to God. 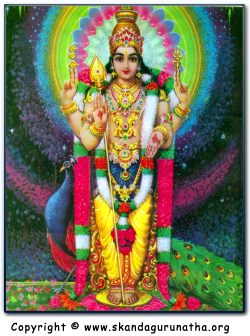 Skanda Guru Kavasam is a hymn filled with bakthi to invoke the true Guru within us (God) - in the form of Lord Murugan - and beseech Bhagavan's grace to help us attain our true nature. For those without a Guru, Sri Skanda becomes our Guru. For those with a Guru, Sri Skanda helps us realize the Oneness of Guru and God. May Bhagavan Sri Skanda's blessings always be upon you all. A very special thank you to Sri P.R. Ramachander and Sri Elango Kadhirvel for providing the above English transliteration and meaning of Skanda Guru Kavasam. May Bhagavan Sri Skanda's blessings be upon you both always!